Former McLaren driver David Coulthard says people must not expect too much of fellow Scot Paul di Resta in his debut season on the Formula 1 circuit. 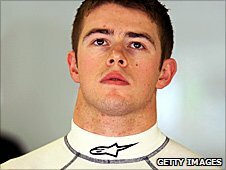 Di Resta, 24, is one of Force India's drivers for the coming campaign alongside German Adrian Sutil. "If Paul can get close to Adrian or match him in the early races that would be incredible," said Coulthard. "If he can be in front of him near the end of the year, that sets him out as a driver to be watched for the future." The Scot's elevation from test driver at Force India brings the number of British drivers on Formula 1 grid to three, alongside former world champions Lewis Hamilton and Jenson Button. And BBC's F1 commentator Coulthard believes the experience the rookie has already gained with the constructor will stand him in good stead. "It's invaluable," said Coulthard, who also drove for Williams and Red Bull and took a career total of 13 chequered flags. "You have to adapt to the different demands of a Grand Prix car. "But the biggest thing for me is that he's known within the team - he knows the mechanics and the engineers - and he's comfortable in that environment. "He'll understand how to work with these people, because it's not a holiday camp, it's a really tough business and you have to know who to turn when the car's not working properly. "There's a real technical aspect to making sure he can get the best out of himself on the track." Coulthard has witnessed Di Resta's potential at close quarters, and is eager to help his compatriot make the best possible start to his F1 career. "I competed against Paul on the same track last year and he won the German Touring Car Championship. "This is a great opportunity for him with Force India and he thoroughly deserves his chance. "It's pretty much a mid-grid team, but we're all hoping the car will be more competitive. "Being successful in Formula 1 is not just about having talent, you've got to have a good car and a good team. "I'm obviously very proud to have another Scot in Formula 1 and anything I can do to help Paul I'm going to do, because if it works out he could have a great career. "But I think we have to be realistic and keep our expectations in check." Di Resta took his first steps in F1 last season when he was signed as Force India's reserve driver, taking part in eight first practice sessions. Already he has shown signs of early promise, finishing fourth and third fastest respectively on days one and two of the first practice session of 2011 in Valencia.